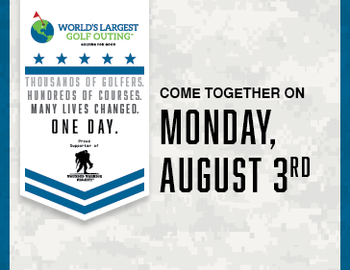 Mark your calendars for The Worlds Largest Golf Outing on Monday, August 3rd!! The World's Largest Golf Outing (WLGO) is about having a great day of golf with friends, family and colleagues, while benefiting Wounded Warrior Project® (WWP). This WLGO event is an 18 hole four person team scramble format. The registration fee includes a $10 per player donation to WWP, green fee, shared cart, warm up bucket, lunch, a WLGO logo'd tote, hat, towel, golf ball and divot tool, local prizes and awards ceremony following play. You can register as a single, twosome, or foursome. Please know that if you register as a single or twosome you cannot combine fundraising efforts with another team. However, you can request to be paired with another single or twosome for playing purposes. Click Here for more details and to register for the event. Let's make this year the best yet!